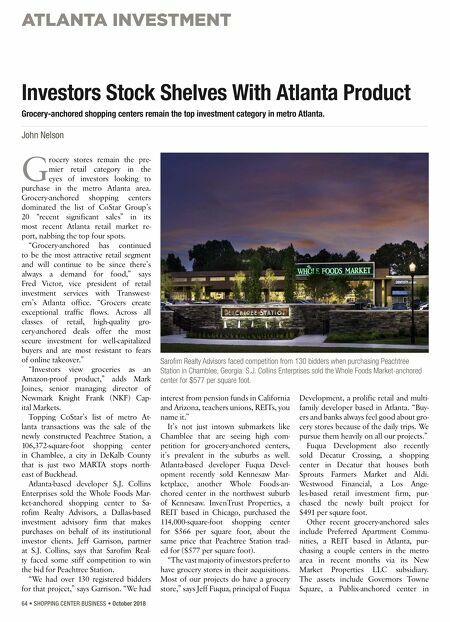 ATLANTA INVESTMENT 64 • SHOPPING CENTER BUSINESS • October 2018 G rocery stores remain the pre- mier retail category in the eyes of investors looking to purchase in the metro Atlanta area. Grocery-anchored shopping centers dominated the list of CoStar Group's 20 "recent significant sales" in its most recent Atlanta retail market re- port, nabbing the top four spots. "Grocery-anchored has continued to be the most attractive retail segment and will continue to be since there's always a demand for food," says Fred Victor, vice president of retail investment services with Transwest- ern's Atlanta office. "Grocers create exceptional traffic flows. Across all classes of retail, high-quality gro- cery-anchored deals offer the most secure investment for well-capitalized buyers and are most resistant to fears of online takeover." "Investors view groceries as an Amazon-proof product," adds Mark Joines, senior managing director of Newmark Knight Frank (NKF) Cap- ital Markets. Topping CoStar's list of metro At- lanta transactions was the sale of the newly constructed Peachtree Station, a 106,372-square-foot shopping center in Chamblee, a city in DeKalb County that is just two MARTA stops north- east of Buckhead. Atlanta-based developer S.J. Collins Enterprises sold the Whole Foods Mar- ket-anchored shopping center to Sa- rofim Realty Advisors, a Dallas-based investment advisory firm that makes purchases on behalf of its institutional investor clients. Jeff Garrison, partner at S.J. Collins, says that Sarofim Real- ty faced some stiff competition to win the bid for Peachtree Station. "We had over 130 registered bidders for that project," says Garrison. "We had interest from pension funds in California and Arizona, teachers unions, REITs, you name it." It's not just intown submarkets like Chamblee that are seeing high com- petition for grocery-anchored centers, it's prevalent in the suburbs as well. Atlanta-based developer Fuqua Devel- opment recently sold Kennesaw Mar- ketplace, another Whole Foods-an- chored center in the northwest suburb of Kennesaw. InvenTrust Properties, a REIT based in Chicago, purchased the 114,000-square-foot shopping center for $566 per square foot, about the same price that Peachtree Station trad- ed for ($577 per square foot). "The vast majority of investors prefer to have grocery stores in their acquisitions. 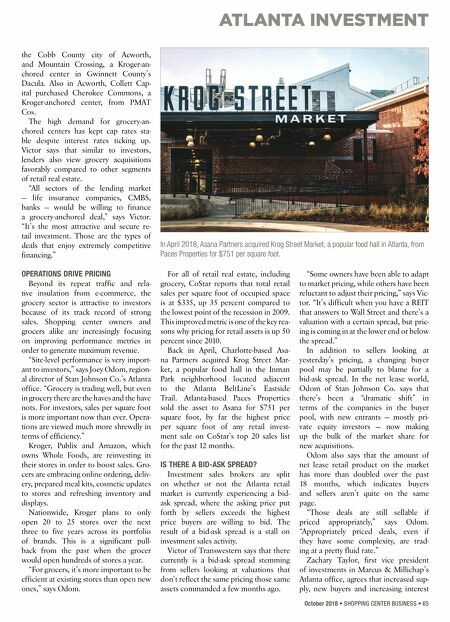 Most of our projects do have a grocery store," says Jeff Fuqua, principal of Fuqua Development, a prolific retail and multi- family developer based in Atlanta. "Buy- ers and banks always feel good about gro- cery stores because of the daily trips. We pursue them heavily on all our projects." Fuqua Development also recently sold Decatur Crossing, a shopping center in Decatur that houses both Sprouts Farmers Market and Aldi. Westwood Financial, a Los Ange- les-based retail investment firm, pur- chased the newly built project for $491 per square foot. Other recent grocery-anchored sales include Preferred Apartment Commu- nities, a REIT based in Atlanta, pur- chasing a couple centers in the metro area in recent months via its New Market Properties LLC subsidiary. The assets include Governors Towne Square, a Publix-anchored center in Investors Stock Shelves With Atlanta Product Grocery-anchored shopping centers remain the top investment category in metro Atlanta. John Nelson Sarofim Realty Advisors faced competition from 130 bidders when purchasing Peachtree Station in Chamblee, Georgia. S.J. Collins Enterprises sold the Whole Foods Market-anchored center for $577 per square foot.